While I’m traveling and unable to post new material, I’m re-running some favorites from the earlier days of this blog. This one originated last July. Enjoy! When I was preparing to go to Australia, I tried to keep realistic expectations when it came to the wildlife I’d see. Kangaroos and emus? Probably. Koalas and platypuses? No – I wouldn’t be anywhere near the right habitat. But despite my lack of platypus-viewing opportunities, there was another monotreme that, with just a little luck, I might run into. 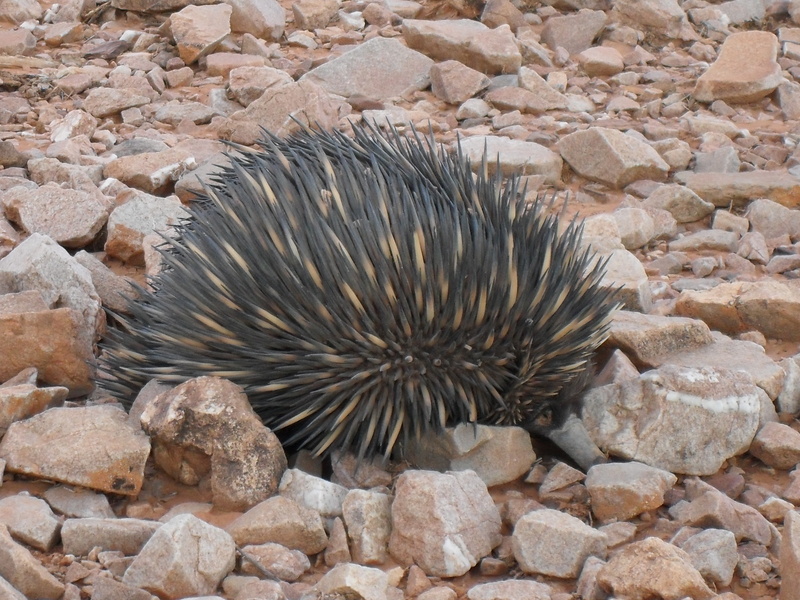 The first time I saw an echidna, I had only been there a few days. I didn’t have my camera with me (yes, I was dumb enough to go for a walk in the Australian Outback without my camera), but if I had seen one that quickly, surely I’d see more, right? Then weeks passed. Weeks and weeks. I started to lose hope. Had I missed my one opportunity to get some photos of a real live monotreme in its native habitat? Nearly two months later, I finally saw a second one, and this time I had my camera on me. Thank heavens. The great thing about echidnas is that they can’t really move any faster than a waddle, so when they see you they don’t even bother trying to run away. 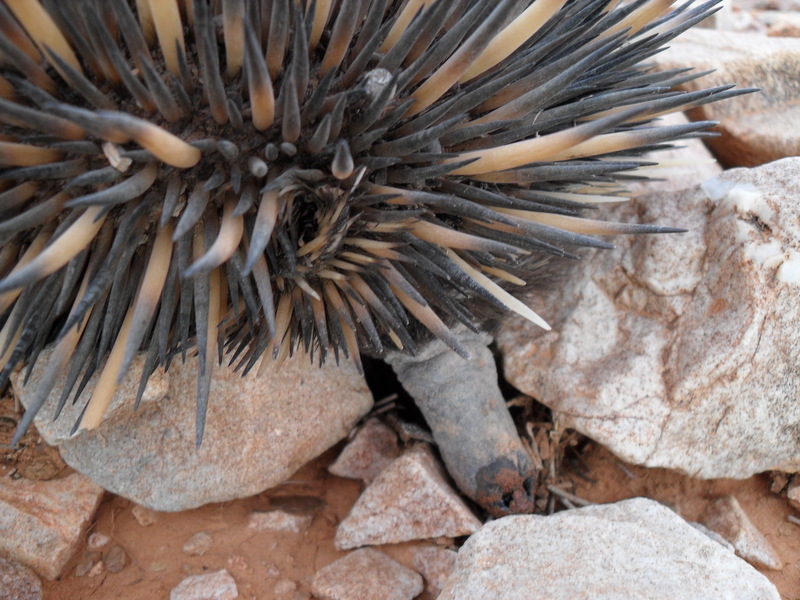 When you get too close they just curl up into a prickly ball and wait for you to leave. You can get as close as you want to take photos, and I admit I couldn’t resist reaching out to touch one of its spines! Updated to add: I showed one of my echidna photos to a coworker, and she said, “What the heck’s an echidna?” So in case you’re not in the know, an echidna is a monotreme, or egg-laying mammal. There are actually several species of echidna in Australia and New Zealand, and they’re the only close living relatives of that other, more famous monotreme, the platypus. 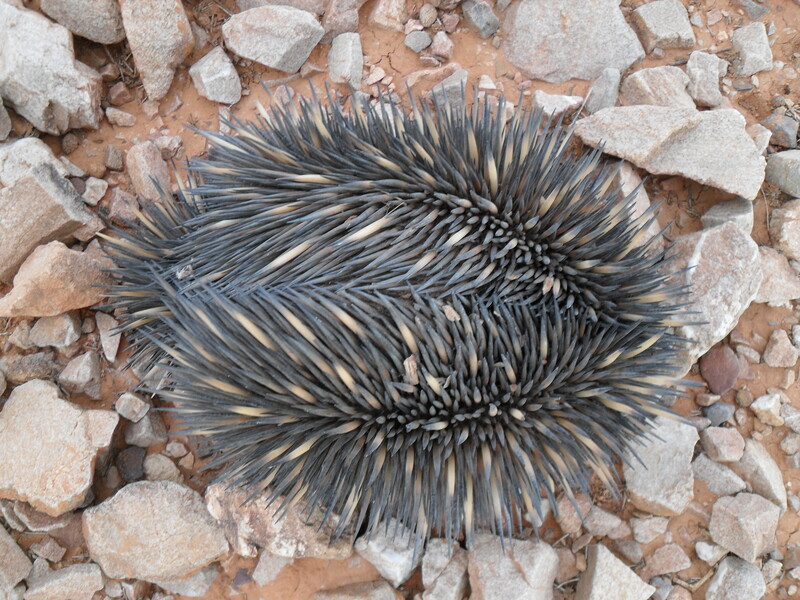 This is a short-beaked echidna, Tachyglossus aculeatus. Previous Previous post: Flashback: Dust Storm of the Century!